I've been getting some good views about the UK before "Socialism" from this book "Ragged Trousered Philanthropists". It is very relative to the current situation in the United States as we struggle on these same problems. Clearly frustrated at the refusal of his contemporaries to recognise the inequity and iniquity of society, Tressell's cast of hypocritical Christians, exploitative capitalists and corrupt councillors provide a backdrop for his main target — the workers who think that a better life is "not for the likes of them". 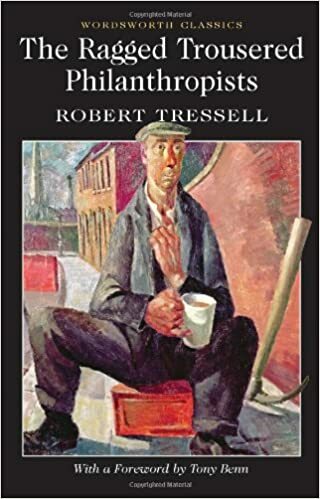 Hence the title of the book; Tressell paints the workers as "philanthropists" who throw themselves into back-breaking work for poverty wages in order to generate profit for their masters. I actually checked the library catalogues of various cities around the USA and found it was unavailable except in NYC, and even there it was only a "reference" book that couldnt be checked out of the library. I think there was some sort of "audio" version in San Fransico, like they dont want you to have the text. Eventually, I ordered a copy and have it in my personal library. I am excited to learn about this book. The attitudes of workers, toward their exploiters, in Edwardian England, parallels that of large numbers of ordinary Americans today. On Amazon, there are 11 different offerings for slightly different formats of "The Ragged Trousered Philanthropists". It's also available, at no charge in a Kindle edition, which is the way I will read it. Cool. Yes, I was actually told about that by someone in Yorkshire UK that I have a lot of respect for. Otherwise, I wouldnt know about it. I got the paper copy that has the painting of the worker drinking black tea called "The Tea Break". I often look at the painting on the cover, as I make paintings of similar scenes with the same medium: oil on wood panel.